A few weeks ago I was driving in heavy traffic at the end of a long hot day. As I approached an intersection it was obvious that road construction was partly to blame for the traffic crawl. My decision to bail and take another route solidified when a break opened in the lane beside me. I signalled, started to pull into the lane, when suddenly a car races forward, cutting me off. What happened next pushed my very last button. I pull into the lane once this accident waiting to happen is clear of my vehicle. The light changes, traffic starts to move; all traffic except aggressive jerk – now his signal light is on indicating he wants to turn into the lane I just left. Holy crap! For five whole minutes jerk is at a full stop in front of me – I lost it – people must have thought I was crazy as I leaned on the horn screaming “what is wrong with you”. I really don’t like jerk drivers. Mosquitoes find me irresistible. Sure they attack my arms and legs, I react badly to their bites but can deal with these assaults. If only it stopped at that – somehow these demons manage to torment me by zeroing in on feet, knuckles, elbows, and ankles. I hate mosquitoes. Who am I to judge another persons life style. Knock yourself out – choose to be a vegetarian or vegan – you have your reasons; moral , religious, ethical – no problem. My blood pressure only rises when you dress tofu up as turkey. Tofurkey makes me want to scream. Why would you want to pretend to eat turkey? It’s soy beans, a lifestyle choice you’ve made, not damn turkey. Dogs are not supposed to wear shoes. 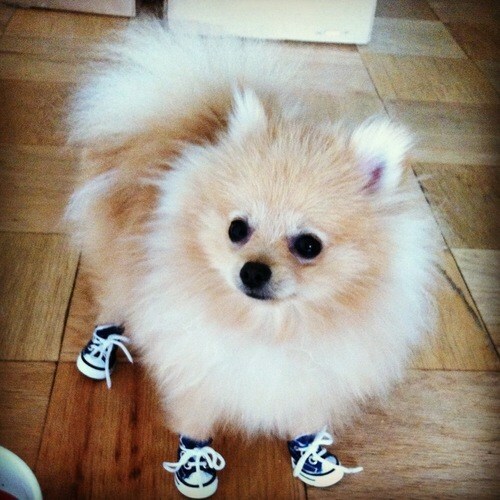 There’s nothing cute about your Pomeranian’s sneakers. While I’m at it – dogs want to run in the park, not be pushed about in a carriage. Dogs are not dolls waiting for you to play dress-up. I’m a smoker; I know the health risks, it’s my choice, and smoking is legal. The government collects millions of dollars in taxes from cigarettes. A package of 20 cigarettes costs over ten dollars but I can’t smoke in a city park, on the beach, in a bar, restaurant patio or within 6 metres of any business. My blood boils when entering a premise populated by militant recyclers or delusional environment fanatics. Terms like sustainable, free trade, ethical, organic, and local fill the air as they make coffee one cup at a time using single plastic packages of “organic, free trade espresso” in their expensive coffee machine. Are you kidding me? Single plastic packages for one cup of coffee? While on the subject of coffee – I refuse to utter the words venti or grande – my coffee is small, medium, or large. I can’t ponder any more, it’s making me grumpy. What bothers you?